When close friends and family ask me for the best time to visit Disneyland during the holidays, I always recommend the week after Thanksgiving. The majority of decorations are in place, the holiday parade and fireworks are on the schedule, and fresh candy canes are in the Candy Palace—but the peak holiday crowds are still a week or two away. This is also the only weekend to see the Candlelight Processional without a trip to Florida. Disneyland's Candlelight Processional takes place this Saturday and Sunday, December 1 and 2. Started by Walt Disney in 1958 as a community appreciation event, the show features a candlelight choir made up of cast members and community choir members, all accompanied by the Disneyland orchestra. Celebrity guest narrators read the Christmas story in between songs. Disneyland rarely officially announces the celebrity narrator in advance, but their identity usually leaks out well before the show. Last year, Disneyland kept the identity of the narrator a secret right up until the moment Thor star Chris Hemsworth stepped onstage for a pre-show sound check on Saturday afternoon. As with last year, Disney has managed to lock down the rumor mill this year, so we have no idea who to expect at the podium. After trying a few times to make this a larger public offering with dining packages and reserved viewing, Disney has returned to the practice of treating Candlelight as a private event that just happens to take place in the middle of an operating theme park. Invited guests include community and civic leaders, as well as media and Club 33 members. It is very difficult for other visitors to get a perfect view of the show without devoting an entire day to saving a spot on Main Street, U.S.A. Still, this event has become an annual tradition for many of our readers, and we share tips from past years to hope you enjoy—or avoid—the Candlelight Ceremony and Processional as it takes over Main Street, U.S.A. for this most magical weekend. 4:45 p.m. – Seating of invited guests begins for the first performance. 5:20 p.m. – The first processional begins. 5:30 p.m. – The first ceremony begins at Town Square. 7:15 p.m. – Seating of invited guests begins for the second performance. 7:35 p.m. – The second processional begins. 7:45 p.m. – The second ceremony begins at Town Square. You have some options if you want to view the ceremony. Standby viewing is very limited, and is on a first-come, first-served basis. Bench seating is available near the Christmas tree on the west side of Town Square; standing room-only locations are near City Hall, the Opera House, and any open spaces behind the seating area in Town Square. Viewing areas for the 5:30 p.m. performance opens at park opening (8 a.m. each day, with Extra Magic Hour and Magic Morning at 7 a.m. on Saturday), but viewing areas on the east side of Main Street are not available until after the 3:15 p.m. "A Christmas Fantasy" parade passes that location. All guests must leave the viewing area after the first performance has concluded. The line for the 7:45 p.m. performance then forms at the south end of Main Street, as soon as the 5:20 p.m. Processional has passed. Guests with disabilities may sit in any of these viewing areas. A special assistance viewing area will also be provided on the east side of the viewing area, outside of the Opera House. If you don't want to devote the day to saving the perfect spot on Main Street, you can still enjoy the Processional down Main Street, U.S.A. and hear the performers sing as they walk to the stage. Just grab an open spot along the curb on Main Street, between the Camera Shop and the Christmas tree. The first processional begins at 5:20 p.m., and the second at 7:35 p.m.
Main Street Opera House – 3:00 to 10:00 p.m.
Tomorrowland Theater – 1:00 to 8:00 p.m. The Mad Hatter on Main Street – 4:00 to 9:00 p.m. The Disney Gallery – 4:45 to 9:00 p.m.
Disneyland will again use the backstage passageways behind Main Street, U.S.A. If you don't need to be on Main Street between 5:00 to 9:00 p.m., take advantage of lighter crowds throughout the rest of the park. 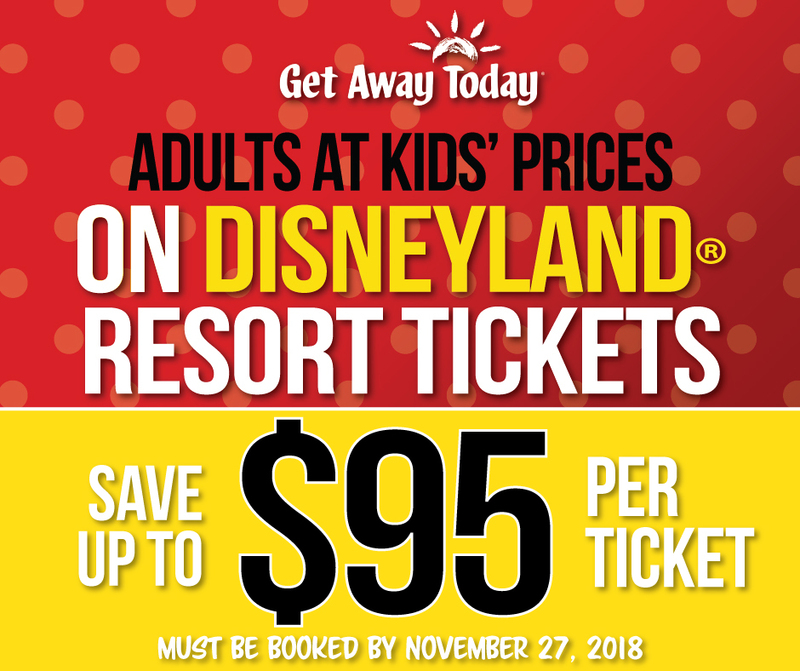 Southern California residents know that Disneyland frequently offers a "SoCal Salute" in the spring, a discount available only to local residents and for travel before the summer travel season begins. For 2019, it looks like everyone will be able to take advantage of deep discounts for spring travel, as Disneyland tries to maximize attendance during the last "slow season" before Star Wars: Galaxy’s Edge Opens opens next summer. The Limited-Time Special Ticket Offer is valid for travel January 7 through May 23, 2019, excluding the spring break blockout of April 14–22, 2019. The price is the same for all ages 3 and older, and each ticket includes one Magic Morning entry. This offer is about $11 more than the locals-only deal from 2018. Tickets must be purchased by May 18, 2019. You must use all entries within 13 days of the initial entry, which provides some flexibility to visit as many as three weekends in a row. With the 4th and 5th day adding just $19 and $10 to the base ticket price, it's definitely worth adding the extra days if you can fit even a half-day visit into your week. 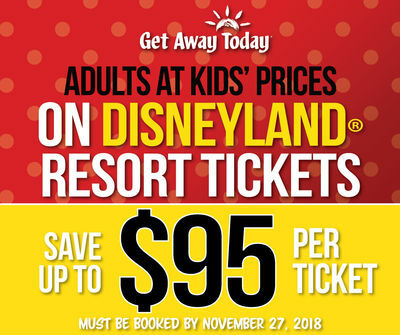 MousePlanet sponsor Get Away Today is offering Adult Disneyland Resort Tickets at Kids prices for travel through 2019, when you purchase tickets by November 27. *Savings vary per ticket and are calculated based on annual park pricing. Blockout dates April 14–22, 2019. Standard pricing with Adults at Kids' Prices $19 per tickets savings will apply for travel over these dates. Celebrate Valentine's Day a week early with the Sweethearts Nite on Thursday, February 7. Immerse photo opportunities featuring romantic scenes from iconic Disney films. On Thursday, March 7, blast to the past with '90s Nite at Disneyland. Special '90s-themed fireworks show, throwback musical entertainment and more. A re-imagined Disney Afternoon Avenue with special greetings from favorite Disney characters from the '90s and interactive photo opportunities. The events each run from 9:00 p.m. to 1:00 a.m., and ticket-holders can mix-in to Disneyland as early as 6:00 p.m.
Tickets for both events are $99 per person, and go on sale this week. Disneyland Resort annual passholders can purchase tickets starting Tuesday, November 27. Any remaining tickets will go on sale to the general public the following day, on Wednesday, November 28. Parking is not included in the event fee. Ralph Breaks VR is now open at The Void in Downtown Disney. This hyper-reality experience is offered select days (most Sundays, Tuesdays, and Thursdays) alongside the existing Star Wars: Secrets of the Empire experience. It's time to break into the internet! Get ready for Ralph Breaks VR, the latest hyper-reality adventure by ILMxLAB, The VOID, and Walt Disney Animation Studios officially opening on November 21st. In Ralph Breaks VR, you and your friends will sneak onto the internet to play the newest, coolest video game ever alongside Wreck-It Ralph and Vanellope von Schweetz. And, have the ultimate food flight in Pancake Milkshake Diner. The 30-minute experience costs $34.95, plus a payment processing fee of $2.85. Tickets are available online. No discounts are currently offered to annual passholders or Disney cast members. The experience has a minimum height requirement of 48 inches, and The Void recommends that participants be at least 10 years or older due to the weight of the gear. However, employees also say that this experience is much less intense than the Star Wars version. Participants under age 18 must have a parent or guardian sign a waiver. ...Disneyland has filed a pair of permits for a re-roofing project on Sleeping Beauty Castle. The company says this is a scheduled refurbishment, and not related to the Get Your Ears On marketing campaign. ...Disney has not released the official dates or details for the 2019 Lunar New Year celebration at Disney California Adventure, but has shared that the Three Little Pigs will be on hand to celebrate the Year of the Pig. Lunar New Year is Tuesday, February 5, 2019. ...The Carthay Circle restaurant in Disney California is now promoting the upper patio level of the restaurant as the Carthay Circle Terrace Lounge, and a recent Orange County Register article bills it a "hidden bar with a secret entrance." Hyperbole aside, the patio was a rarely-used seating area for the Carthay Circle restaurant, and is being tested as an adults-only lounge, serving a variation on the Carthay Circle Lounge menu. Seating is by request only, and most guests will access the restaurant via a staircase at the back of the theater building, though the Terrace Lounge is wheelchair-accessible via the main restaurant's elevator. ...Indiana Jones Adventure is closed this Tuesday through Thursday, November 27–29 for refurbishment. Indiana Jones Adventure – closed November 27–29 for refurbishment. Wetzel's Pretzels – closed for refurbishment through November 30. Candlelight Ceremony and Processional – Saturday, December 1 and Sunday, December 2, with two performances each night.